Do you enjoy long, soothing baths? Make your bath last with this Men's Inflatable Bathtub Costume. This inflatable tub uses a battery operated fan to keep it’s shape all night. Who said you can’t take the spa with you? This halloween make a splash with this hilarious and memorable costume and with a large rubber duck to keep you company, you will never feel alone. Order now before the water gets cold! 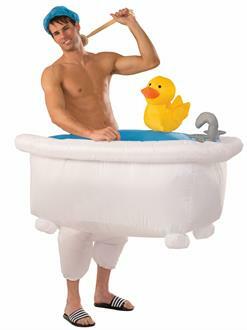 Includes (1) Shower Cap and (1) Inflatable Tub With Attached Duck.